At Fletcher Farm, our cows are our number one priority. Happy, healthy cows produce higher quality milk. We feel that keeping the cows clean, comfortable and eating a balanced diet is the most important part of our job. Our herd consists of 75 milking cows and 75 calves and heifers. We have two breeds on our farm: Holsteins and Jerseys. Our cattle are all registered, which means they have their lineage documented many generations back. Cow families are very important to our family; in fact, we have several cows in our milking herd who have daughters, granddaughters, and even their great-granddaughters milking alongside them each day. It is a unique challenge to make mating decisions for each cow over the course of the year. It is like trying to create the perfect cow—we take into considerations her strengths and weaknesses, and use males that will help compliment and improve those traits. Then, once she has a calf, we get to watch it grow and develop and see how the mating worked out! We grow the food that our cows eat. 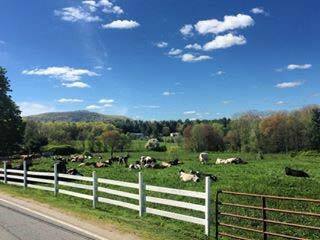 We grow hay and corn, and also allow the cows to harvest their own forages by grazing on pasture. We supplement what we grow with grain from a local grain company, and have a nutritionist who visits our farm regularly to make sure all of the animals on the farm are eating a balanced diet. They have fresh water available at all times. How old is your oldest cow? Our oldest cows in the herd are currently 14 years old. We have two Jersey cows, Daria and Jolene, who were born in 2004. They are the leaders of the herd. Why do the cows have tags in their ears? Our cows are identified using several tags. They have a round button tag in their ear that is an RFID (radio frequency identification) tag. This makes them traceable back to our farm in the case that they were sold, or also when we take them to be exhibited at local fairs and shows such as the Big E. There is a wand that can be waved near the tag, and the animal information will pop up. These tags are very important as they help the USDA track animals in the case of a disease outbreak or if they cross state lines. The other tags they have are our herd tag, which has their number on it and usually some basic information such as birthdate. All our cows have names, but they must have tags as well. How do you name your cows? We name our cows based on the first letter of their mother’s name. For example, the cow Jolene who was mentioned above has daughters named Jalapeno, Jelly & Jam (twins), January, Julip, Jean, and Jenny, and granddaughters named Jewel and Judy. How come your cows are not outside all the time? In 2011, we built a new barn that totally focused on cow comfort. 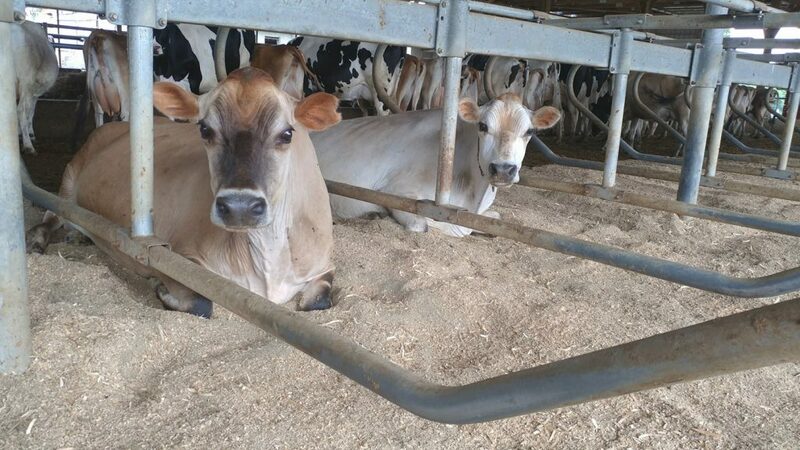 It has three large water troughs, sand-bedded stalls, grooved floors for extra traction, and all the space to eat that a cow could need. The barn has sides that roll up and down to allow fresh air in the summer, and block the wind and cold in the winter. We feel that pasturing our animals is very beneficial to their health, but sometimes it is better for them to stay inside their comfortable barn. For example, in extreme weather conditions of the winter or summer, the cows can stay in and eat, drink and be merry without the added stress of extreme heat or bitter cold. Cows like it about 50 degrees, so extremes cause them stress. We will also keep them inside if it is very muddy or windy, or if the pasture is worn down and needs time to regrow. Do cows need help giving birth? Cows are really tough creatures! Most of the time, they do not need assistance having a calf. We like to let nature run its course, and only intervene if we feel the labor and delivery is not progressing fast enough to ensure a successful arrival of a new baby calf. If we do help the mother out, the reason may be that the calf is coming backwards, the cow is having twins, the mother is not pushing or trying at all, or the calf is not in the correct birth position. The calf should be coming front feet and nose presenting first. Sometimes a leg might be tucked back or something similar, and the calf just needs an adjustment. Why do the baby calves live alone in little houses? Our baby calves live the first 12 weeks of their lives in calf hutches. These are basically cribs for calves. 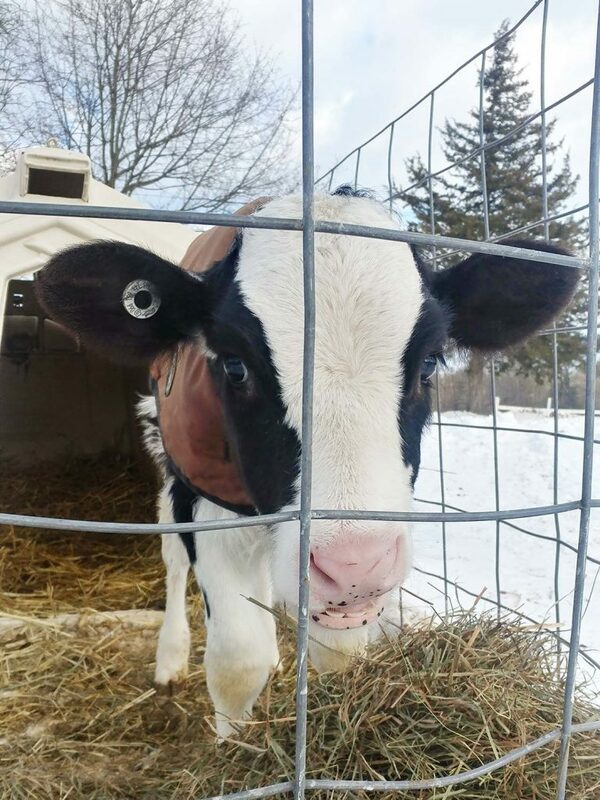 The babies have developing immune systems, and it is best for them to not be in contact with other calves until they have been weaned off of milk and are off to a good start. The calves can go inside or be outside in the nice weather. 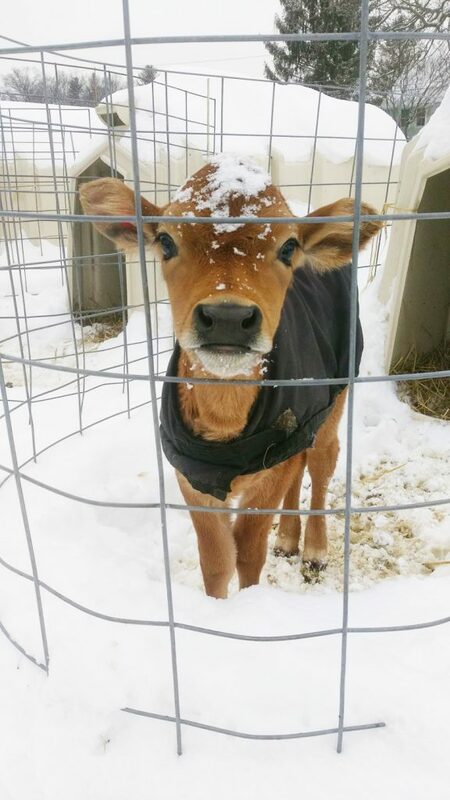 In the winter, the hutches are bedded with straw and the calves wear jackets. 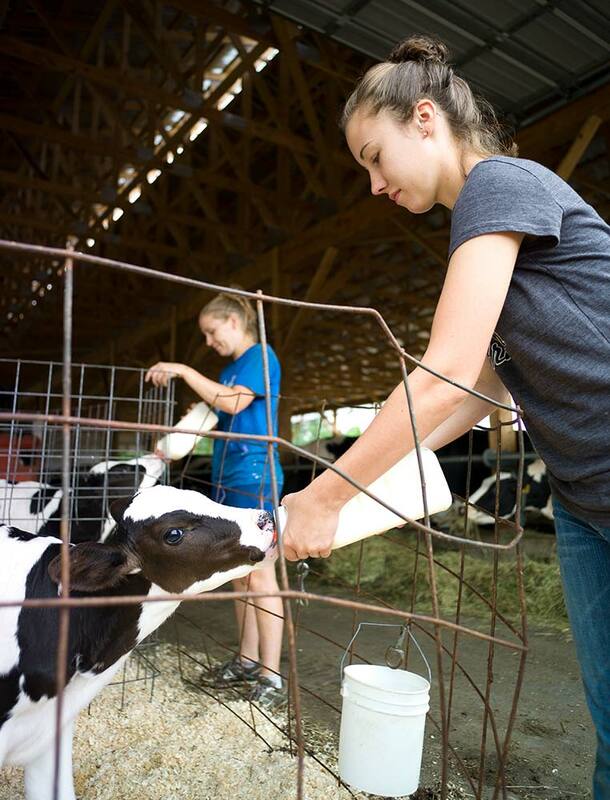 In the summer, calves are bedded with wood shavings and the hutch windows are opened. They are sanitized in between calves and can be moved around wherever we want. © 2019, Fletcher Farm. Website by Anne Campbell Design.